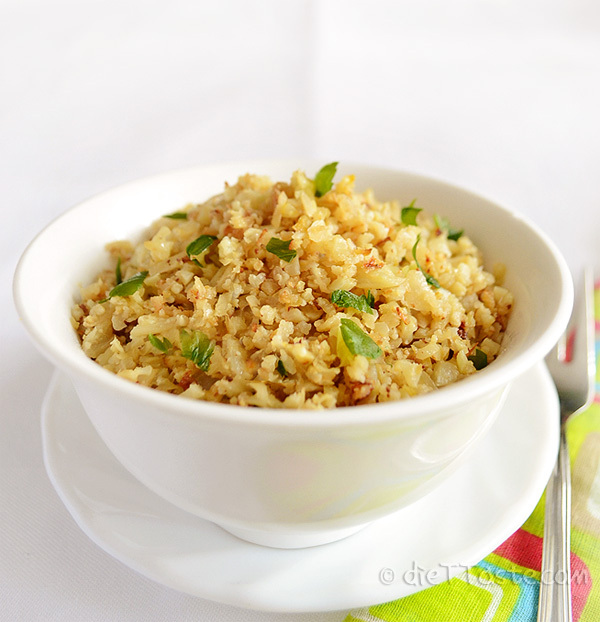 Riced Cauliflower – healthy and easy substitution for rice. Low-carb, low-fat and gluten free with only 9 carb grams per serving! 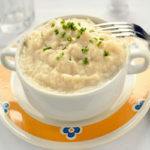 Did you know that cauliflower can be a great substitute for rice in many dishes? Riced Cauliflower does not taste exactly like rice, but it has very low carbohydrate content (30 carb grams per 1 cauliflower head; 9 carb grams per serving) which is great for everybody who wants to lose weight or has to watch their carb intake, like diabetics. It is also low in calories and gluten free. The best way to substitute rice with cauliflower is in dishes like fried rice, rice salad or in any recipe that calls for serving over a bed of rice under a sauce. 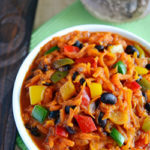 On the other hand, it does not work well as a substitute for rice in casseroles because it does not absorb liquid so well and has no starch as a binding agent. Here you will find a way to make your riced cauliflower and use it to create a basic cauliflower “fried rice” on your stove. 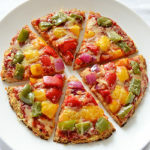 You can also bake riced cauliflower in the oven – just spread it out on a baking sheet and bake for about 15 minutes in the oven. Riced cauliflower can also be steamed or microwaved. 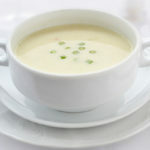 To steam it, add about 2 tablespoons of water to your pan with the cauliflower, cover and cook until tender. 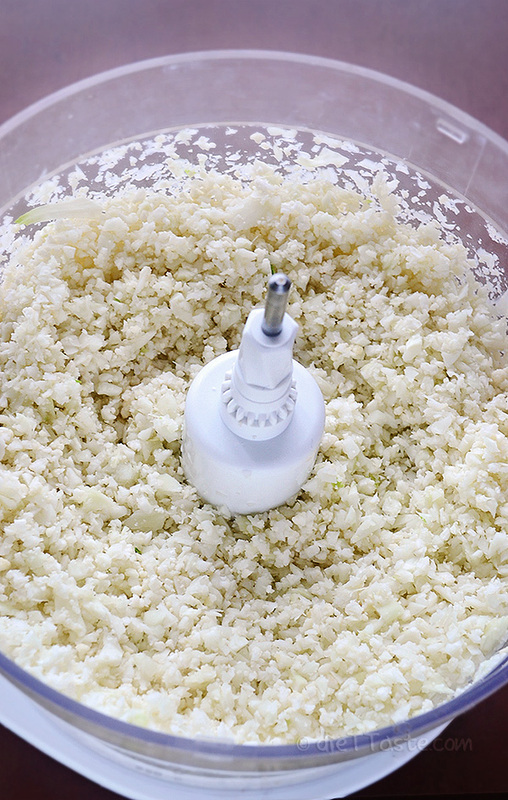 The easiest way to make riced cauliflower is to process it in your food processor. 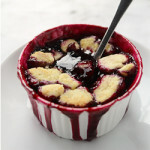 But it can also be made without food processor – grated by hand with a greater. Also, you can make a large batch of riced cauliflower and freeze it in freezer bags for later use. 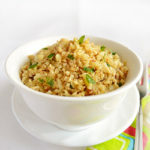 Riced Cauliflower - healthy and easy substitution for rice. Low-carb, low-fat and gluten free with only 9 carb grams per serving! TO MAKE RICED CAULIFLOWER: Break the cauliflower head into large florets. Rinse them well and pat them dry with a paper towel. 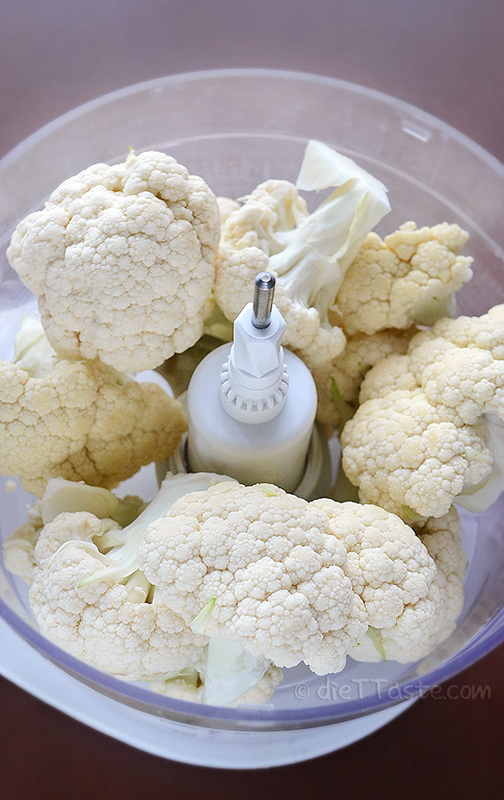 Eithr grate your cauliflower or you can process it in a food processor. Do not over process, or the cauliflower will get mushy. 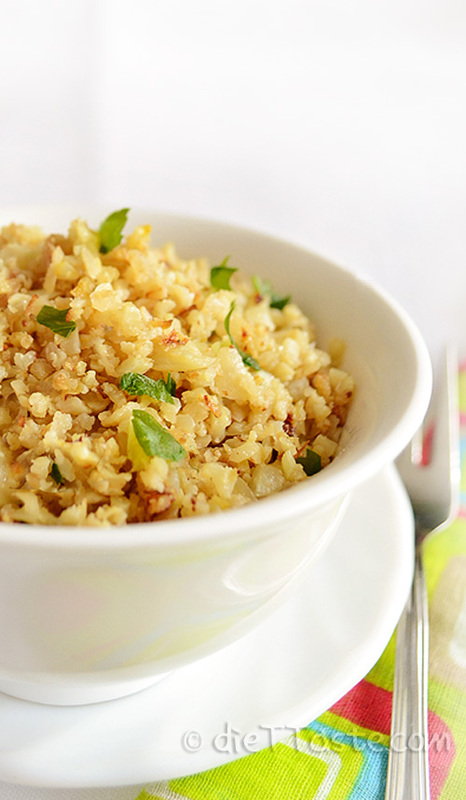 TO MAKE CAULIFLOWER “FRIED RICE”: Heat olive oil in a large pan over medium heat. Add chopped onion and sauté until soft. 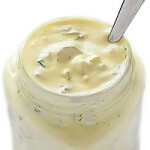 Furthermore, you can add some fried scrambled eggs, green onions, soy sauce or chicken pieces.